Lunar New Year arrives on February 16. 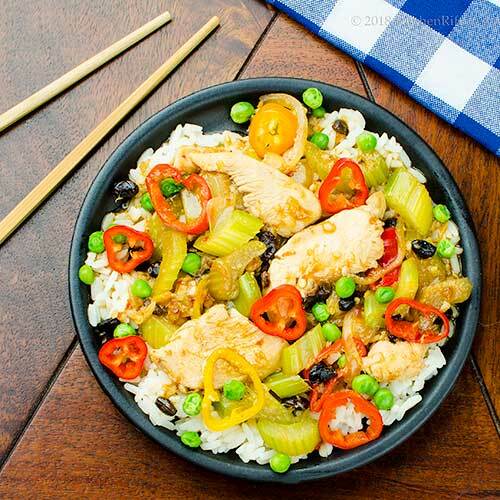 So how about some Chinese-inspired stir-fry? Asian cooking can look complicated to Westerners, but it’s actually pretty simple. It’s all about the prep – the cooking takes very little time. So fetch some flavor for the Year of the Dog. This recipe combines stir-frying with braising. In the West, most of us don’t have stovetops with intensely high heat (required for traditional stir-fry). So this combo method is easier for most home cooks. The texture of the dish will be a bit different from true stir-fry, but the flavor is excellent. Celery works well in Chinese dishes, as does chicken. But flavor-wise, these ingredients aren’t actually the stars of the show. That distinction goes to the ginger-and-garlic sauce that permeates the dish. Fermented black beans (see Notes) add extra zip. Can’t find fermented black beans? No worries – just leave them out (but see Notes). This recipe yields about 3 main-course servings. Or twice that number if you use the dish as just one of many in a traditional Chinese meal (see Notes). Leftovers keep for a couple of days if refrigerated in an airtight container. Cut the chicken into pieces of about 1 inch. Place the chicken pieces in a mixing bowl and add 2 teaspoons each of rice wine or sherry and soy sauce (may add more if necessary). Toss the chicken with the liquid, then allow it to marinate as you prep the vegetables. Peel the onion. Cut it in half through the equator, then cut it into thin slices. Set aside. Wash and dry the celery, then remove the strings. Cutting on the bias (at an angle), slice the celery into pieces of about ¼ inch (or a bit larger). Set aside. Wash and dry the bell pepper. Core the pepper, then cut it into dice of about ½ inch. If using mini sweet bell peppers: Wash and dry the peppers, then cut them into rounds (we usually don’t core these). Set aside. Peel the garlic and chop it roughly. Add the chopped garlic to a mini food processor. Peel the ginger and chop it roughly. Add the pieces to the mini food processor. Whirl the food processor until the ingredients are finely chopped. Remove the garlic-and-ginger mixture from the processor and set aside. Rinse the fermented black beans with water, then set them aside. Place a large frying pan (cast iron works best; see Notes) or a wok over medium stovetop heat. Let the pan heat for 3 minutes. Raise the heat, then add 2 tablespoons of cooking oil. Add the chicken pieces (including marinade) to the pan. With tongs or chopsticks, quickly cook the chicken pieces on all sides until they begin to brown. Remove the chicken pieces from the pan and let then drain on a plate covered with paper towels. Bring the cooking pan back up to heat, then add more oil if necessary. Add the chopped onions to the pan. Stir-fry for a minute, then add the chopped celery and peppers. Stir-fry about 3 minutes (until the ingredients are cooked but still crispy). Move the ingredients to the side of the frying pan and add the ginger/garlic mixture. Stir-fry for a minute. Add the cooked chicken pieces back to the frying pan. Add the fermented black beans and chili paste. Stir-fry for about 30 seconds, then add the chicken stock and about 1 tablespoon each of rice wine or sherry and soy sauce (or more to taste). Stir the contents of the pan to combine, then lower the heat and cover the pan. Cook for 5 minutes. Uncover the pan and add the green peas. Cook for a minute or two. In the meantime, combine the corn starch (if using) with water. After the peas have cooked, remove the frying pan from the heat and stir in as much of the corn starch mixture as you need to thicken the sauce (we generally use about half of it, but we make more than we think we need just in case). 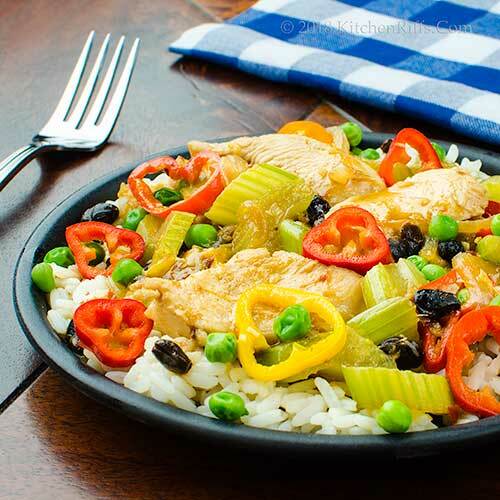 Serve the stir-fry with cooked rice. Garnish with scallion greens or sriracha sauce, if desired. Woks, however, are designed for high heat. So if you have one, use it for this recipe. Cooked rice is the traditional accompaniment for Chinese dishes, and it’s a good one. But you could try grits or polenta too. Fermented black beans can be found in any Chinese food store and are available online (Amazon carries them). They’re not really “black beans” – rather, they are soy beans that are fermented and heavily salted. They look a bit unattractive (OK, more than a bit) but they pack lots of flavor. So you don’t need to use too many at a time. In fact, think of fermented black beans as an extremely flavorful garnish. They work the same way as a sprinkling of Parmesan cheese on a plate of pasta – they garnish it while adding flavor. Some cooks don’t rinse or rehydrate fermented black beans, but we always do. If we’re adding the beans toward the middle or end of a recipe (as we do in this dish), we just rinse them off and then toss them in with the other ingredients. If we add the beans at the beginning of a dish, we generally soak them in water for about 5 minutes, then drain them and add them to the dish. Fermented black beans keep for a long time. We usually refrigerate them (although you probably don’t have to) and they stay usable for a year or more. Can’t find fermented black beans? You could substitute black bean sauce, which is made from them (use a teaspoon or two). But black bean sauce also contains a lot of other flavors, and not all brands taste good to us. So if you can’t find fermented black beans, we would recommend just skipping them. Shaoxing rice wine is traditional in Chinese cooking, but we usually use dry sherry. Why? Because the flavors of the two are very, very similar. As in, almost identical. And we usually have dry sherry on hand, whereas we only have rice wine on hand if we’re doing a lot of Chinese cooking. For this recipe, we used the mini sweet bell peppers that you can often find in packages of about 5 ounces in the produce section of your grocery. They look as though they should be spicy, but they’re not. A regular bell pepper works just as well. Feel free to use more chicken than we specify. Or substitute different veggies for the ones we use. Corn starch is a traditional thickener in Chinese dishes. We sometimes add it, sometimes don’t, depending on our mood. We added a bit to the dish that we photographed for this post (mainly because we like the gloss it gives food). Skip the corn starch if you want – the sauce will be a bit thinner, but the flavor will not be affected. Traditionally, a Chinese meal consists of several dishes that everyone shares. There’s usually no “main” dish. When we have a crowd, that’s how we like to serve a Chinese dinner. But when it’s just the two of us, we usually prepare only one dish and call it a day. Lunar New Year (also called Chinese New Year or Spring Festival) varies in calendar date from year to year. That’s because it’s based on the cycles of the moon, rather than those of the sun (which guides our official calendar). “Yup, it’s been many moons since we made stir-fry,” I agreed, trying to pick up a piece of chicken with my chopsticks. “If I can’t get these chopsticks to work, I’m going to be barking at the moon,” I muttered, dropping globs of stir-fry through my crossed sticks. “Appropriate for the Year of the Dog, I suppose,” said Mrs K R.
“Arf, arf,” I said as a green pea went flying. Love the ingredients in this stir fry... it looks delicious. I'm swooning at the sound of that garlic and ginger sauce. OMG, are there two better flavors around? Happy Year of the Dog! Hi Pam, isn't it a nice combo of flavors! And yes, it is delicious. :-) Thanks for the comment. Hi Kelsie, ginger and garlic sauce is SO good, isn't it? Love that combo. :-) Thanks for the comment. Funny I am just uploading my video for the Chinese New year. Great dish, so true it is not as complicated as one thinks. And I never have celery at home but I have some now, and fermented black beans! Just might make this Friday! Hi Evelyne, celery is wonderful in a stir-fry! And fermented black beans have such a neat flavor. :-) Thanks for the comment. What a great recipe, John. Have you seen Lorraine's mother's recipe for velveting chicken to make it velvety like a restaurant does? It is coating the chicken pieces in a mix of egg white, cornstarch and baking soda and then quickly simmering it in water. I have yet to try it but I think it would be exceptional in your recipe. The flavours sound great. It's been quite some time (probably 25+ years) since I've ordered in Chinese food, it's just been so disappointing so we simply stopped. 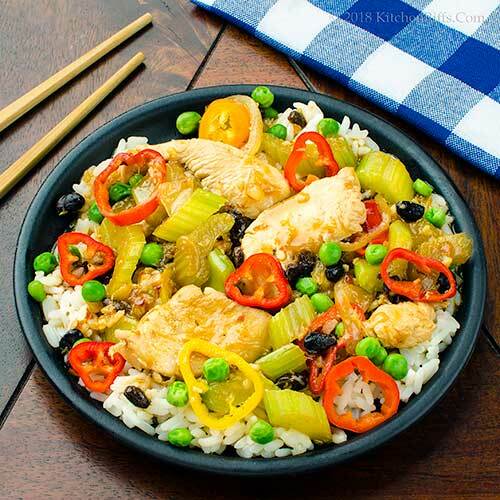 This recipe would give us a better bang for the buck and it would be much healthier because Chinese food tends to be so high in sodium. Then there is the MSG, I won't even go into that. An easy yet flavorful weeknight night meal. Hi Eva, I've velveted chicken before, although I don't believe I've seen Lorraine's recipe for it. It would be fun to try that technique with this recipe, I agree. We have some decent Chinese restaurants close to us, and do visit them sometimes. But the sodium! Even this recipe, where I've tried to reduce the sodium, has more than I'd ideally like. Maybe I should cut the amount of soy sauce and increase the chili paste. :-) Thanks for the comment. Hi Denise, this really is easy! Does take some prep, but you can do most of it ahead. Thanks for the comment. I don't make Chinese food often enough. This recipe looks perfect and flavorful and I love the fermented black beans. I think I will give this a go on the weekend! Hi Dahn, we used to cook a lot more Chinese than we are now, for some reason. You'll love this -- fermented black beans are SO good, aren't they? :-) Thanks for the comment. The stirfry looks so colourful and delicious! Hi GiGI, we don't do stir-fry nearly as much as we should -- easy way to get tons of veggies in your diet. You do need to check that book. :-) Thanks for the comment. Hi Angie, it is! Both. :-) Thanks for the comment. Hi Agness, this is perfect for all the running you do! Gives you loads of energy. :-) Thanks for the comment. Yay, a new recipe for my weekly stir fry. I'd love to find those fermented beans. ... Maybe Whole Foods? Hi Lea Ann, you'll like this. Haven't checked Whole Foods for fermented black beans, but I know Amazon carries them (or did, last time I checked, which was a few months ago). Otherwise any Chinese grocery will have them. Thanks for the comment. We really like Asian food but I very rarely make it. There are so many Asian restaurants around us, Thai, Chinese, and Japanese, and lots of Asian ingredients in the stores though. I used to open cans of La Choy chop suey, etc years ago but now you've inspired me to try it your way. Thanks for the recipe, John! I was pretty young, with no developed pallate, when I first had fermented bean sauce on maybe chicken. And I loved it. This looks like a stunning dish. I just made a dish called Beef Boiled in Fiery Sauce for my husband's birthday, and it was basically beef and celery. I added some chopped bok choy for part of the celery. It just seemed like too much celery to me! Hi Pam, we more often eat at Asian restaurants than make it ourselves, but it's fun to make these dishes at home! :-) Thanks for the comment. Hi Mimi, I really like celery, so it's hard to put too much in a recipe. For me. :-) Thanks for the comment. I never think of using celery in this way, but I need to cook with it more. It's better for more than dipping in peanut butter :) Also, I abuse my All-Clad Stainless cookware and they take it pretty well. Hi Laura, I actually warped the bottom of an All-Clad saute pan. :-( And celery can be such an interesting veggie -- worth experimenting with. :-) Thanks for the comment. My mom was a great fan of celery in her savory cooking. She used every last bit, her favorite was the leafy tops! I don't often make a stir fry, but your flavorful recipe reminds me that I should! This is an excellent dinner recipe. Hi Deb, the leafy tops are the best! Love 'em in soup. :-) Thanks for the comment. Love, love love this recipe John. Happy Chinese new year :). I'm always ready for Chinese! This is such a good, classic recipe. My mouth is watering! Hi Amira, isn't this nice? Happy Chinese New Year, and thanks for the comment. Hi Abbe, we can never resist Chinese grub either! Thanks for the comment. Ooh, I should have planned better for tomorrow's dinner. But your stir fry would be fabulous any night of the year! Delish!!! Hi Liz, this would be an excellent everyday meal. :-) Thanks for the comment. Hi Debra, :-) Good stuff, huh? Thanks for the comment. Year of the Dog, eh? I'd eat this any time! Hi Fran, me too! Thanks for the comment. Celery is really an underrated vegetable, don't you think? Although they're really not allthat flavorful all by their lonesome, they provide a lot of color and crunch. Hi Rosemary, agree it's underrated. And also agree without some help it's a little flavor-challenged. But handle it right, and it's really good! Thanks for the comment. What a great recipe John and thank you for all the wonderful tips you give us. I am going to buy some fermented beans . Hi Gerlinde, fermented black beans have a WONDERFUL flavor! One of our favorite ingredients. :-) Thanks for the comment. This looks like a festival in a pot. I've never delved into Chinese cooking, but this looks like a place I could start. Hi Jeff, Chinese LOOKS scary with all those ingredients, but once you have the prep work done, it goes zip sip sip! :-)Thanks for the comment. Love anything with Chinese black beans in it. It's that deep, salty, big umami flavor that is so addictive. Hi Carolyn, you can never go wrong with Big Umami, can you? :-) Thanks for the comment. 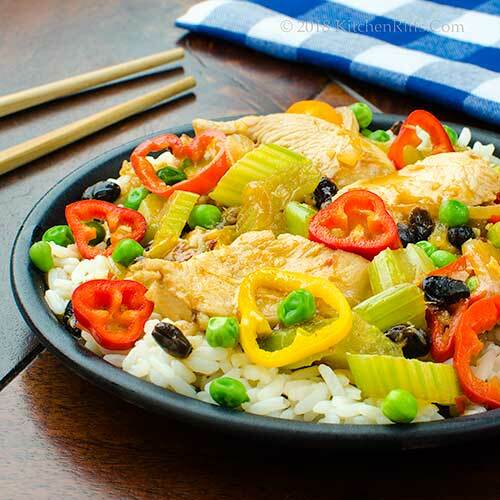 Love all the celery in this stir fry - and all your great tips too! Great way to get the New Year started! Hi Greg, indeed. :-) Thanks for the comment. Hi Tricia, celery is really good when treated right. :-) Thanks for the comment. I love a good stir fry - especially one that starts off with some garlic, ginger and celery! Hi Shashi, that ginger and garlic combo is wonderful, isn't it? :-) Thanks for the comment. Best Lunar New Year's post ever! As always, you had me cracking up over your green pea/howling at the moon story. We had a great new year celebration and hope you did with this dish, too! Hi Ala, isn't this a nice dish? And yes, we had a wonderful Lunar New Year. :-) Thanks for the comment. You are right John, Asian cooking seems pretty complicated, especially Indian :). This stir fry has got all the flavoring I prefer. This is different...for me anyway. There are a couple of ingredients that I have never worked with, and since I'm on a "make something new every week" campaign, this is a great "something new" dish. Thanks John! Hi Shibi, all the different spices in Indian cooking can be a bit overwhelming at times, can't they? :-) Thanks for the comment. Hi MJ, always fun to play with new ingredients! :-) Thanks for the comment. yum looks delish! stir fry is a big hit in this house too. Hi Sherry, stir-fry is wonderful stuff, isn't it? Love it! Thanks for the comment. I love stir fry. This one sounds delicious. Hi Dawn, it is, it is. :-) Thanks for the comment. I love stir fry’s but rarely make them at home, your dish has inspired me to give them another go! Hi Emma, the prep work takes some work when you're cooking stir-fry, but everything else is so easy! And so tasty. :-) Thanks for the comment. We just made something similar to your recipe last night for dinner. However, Our's was not beautifully photographed like yours but just instead inhaled by the boys. LOL Fermented black beans really add a delicious umami flavor to many Asian dishes. Hi Bobbi, fermented black beans are wonderful! One of our favorite ingredients. :-) Thanks for the comment.